Cloud backup options. I use Dropbox, SugarSync and others and it’d be useful to have built in replication ability. 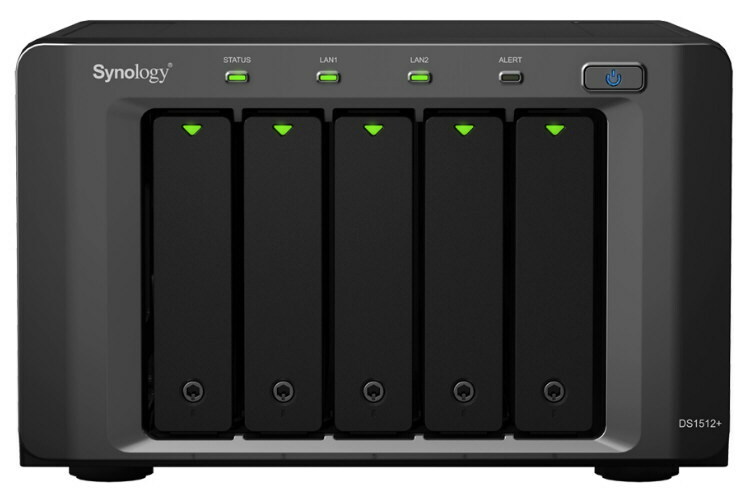 Synology’s Diskstation 1512+. Note: when first released there were some issues with this device but they’ve been addressed by Synology so you can order with confidence. I choose Synology for a couple of reasons, primarily because I’ve heard lots of good things about the company from other bloggers (Jason Nash comes to mind) and Synology have a wide range of devices to choose from at different price/performance points. They’re not the cheapest but many people say the software is the best around and having been bitten once with the IX2-200 I figured I’d go upmarket this time. The model I choose was the relatively new DiskStation 1512+, a five bay unit which satisfies most of my requirements with the exception of tiered storage. I was excited when I first read a while ago that some of the Synology units fully support VAAI but not so this particular model according to Synology (the DS412+ has only limited support). I guess it’s always possible that support will find its way into lower end models such as the 1512+ (even if unsupported) at a future date – here’s hoping! UPDATE Sept 14th 2012 – While both NFS and iSCSI work with vSphere5.0 the 1512+ is only certified by VMware for iSCSI on vSphere 4.1 as of 14th Sept 2012. Previous devices (the 1511+ for example) are listed for both NFS and iSCSI, also with vSphere 4.1. Rather than being incompatible it’s more likely that they just haven’t been tested yet although there are problems with both NFS and iSCSI when using vSphere5.1 and DSM 4.1. UPDATE Oct 3rd 2012 – Synology have released an update for their DSM software which fixes the compatibility issues with vSphere 5.1 although it’s referred to as ‘improved performance’ in the release notes. I’ve not tested this yet but hopefully it’s all systems go. Good work Synology! Having chosen the unit I then needed to choose the drives to populate it with as the unit doesn’t ship with any. My lab already includes some older disks which I could have reused plus I had two SSDs in the NexentaStor server which I considered cannibalising. After reading this excellent blogpost about choosing disks for NAS devices (and consulting the Synology compatibility list) I went with five WD Red 2TB HDDs as a compromise between space, performance, compatibility, and cost. I missed the introduction of the ‘Red’ range of hard disks that’s targeted at NAS devices and running 24×7 but they get good reviews. This decision means I can keep all three storage devices (Iomega IX2, Nexenta and Synology) online and mess around with advanced features like StorageDRS. UPDATE Feb 18th 2013 – Tom’s hardware had a look at these WD Red drives and they don’t seem great at high IOps. I’ve not done much benchmarking but maybe worth investigating other options if performance is key. I bought my Synology from UK based ServersPlus who offered me a great price and free next day shipping too. I was already on their mailing list having come across them on Simon Seagrave’s Techhead.co.uk site – they offer a variety of bundles specifically aimed at VMware home labs (in particular the ML110 G7 bundles are on my wish list and they do a cheaper HP Microserver bundle too) and are worth checking out. Following the setup guide was trivial and I had the NAS up and running on the network in under ten minutes. I formatted my disks using the default Synology Hybrid RAID which offers more flexibility for adding disks and mixing disk types and only has a minimal performance impact. Recent DSM software (v4.0 onwards) has been improved so that the initial format is quick and the longer sector check (which takes many hours) is done in the background, allowing you to start using it much faster.. My first impression was seeing the management software, DSM, which is fantastic! I’m not going to repeat what others have already covered so if you want to know more about the unit and how it performs here’s a great, indepth review. I enabled the syslog server and was quickly able to get my ESXi hosts logging to it. Time Machine for my MBP took another minute to configure and I’m looking forward to experimenting with CloudStation which offers ‘Dropbox like functionality’ on the Synology. Given Synology’s published figures which claim a possible write speed of 194MB/s these were rather disappointing but they’re initial impressions NOT scientific tests (I also tried a similar methodology to Chris using IO Analyser which also gave me some odd results – average latency over 300ms!) so I’ll update this post once I’ve ironed out the gremlins in my lab. Tip: make sure you disable the default ‘HDD hibernation’ under the Power settings otherwise you’ll find your lab becoming unresponsive when left for periods of time. 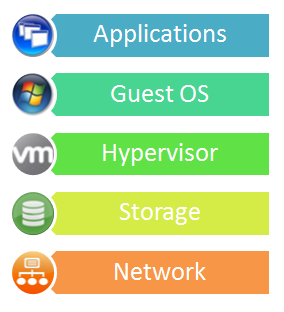 VMs don’t like their storage to disappear just because they haven’t used it in a while! LAST MINUTE UPDATE! Just before I published this post the latest release of DSM, v4.1, was finally made available. DSM 4.1 brings several enhancements and having applied it I can attest that it’s an improvement over an already impressive software suite. Of particular interest to home labs will be the addition of an NTP server, a much improved Resource Monitor which includes IOPS, and an improved mail relay. 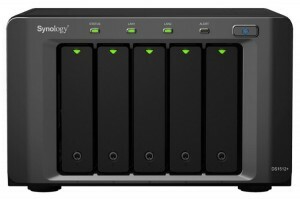 Overall I’m really impressed with the Synology unit. It’s been running smoothly for a couple of weeks and the software is definitely a strong point. It’s got a great set of features, good performance, is scalable and might even include VAAI support in the future.